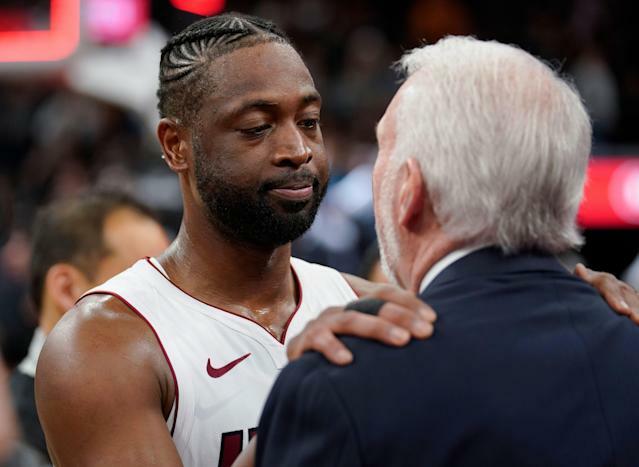 The Dwyane Wade farewell tour saw another successful entry Wednesday night replete with gifts, a video tribute and a big shot from the Miami Heat star in a 110-105 win over the San Antonio Spurs. Wade has famously swapped jerseys with players throughout his planned final season. San Antonio Spurs head coach and two-time NBA Finals nemesis Gregg Popovich beat him to the punch before Wednesday’s game, presenting him with a giant gift box as part of a pregame tribute in front of an appreciative San Antonio crowd. Wade waited to open the gift that contained signed jerseys of Spurs icons Tim Duncan, Manu Ginobili and Tony Parker. Wade, of course, has a history with those fellow future Hall of Famers whom he faced off against in back-to-back NBA Finals, with the Heat winning in 2013 and the Spurs in 2014. Wade repaid Popovich’s kindness with the type of competitive play the Spurs coach has come to expect. With time running out in the third quarter, Wade pulled up from beyond half court to beat the buzzer and extend Miami’s lead to 90-78. When the Spurs closed the gap in the fourth quarter, Wade was there to hold them at bay in the game’s final moments. Wade didn’t have a huge night, tallying 11 points and 2 rebounds in the win. But like he has multiple times this season in his role as a veteran presence off the bench, he made big plays when it counted. He also found someone to swap jerseys with, despite already stocking up on Spurs gear. He and DeMar DeRozan traded jerseys after the game was over.